Step 1 Melt 6 tablespoons butter in a large saucepan over medium heat. Add the onion and garlic and sprinkle with about 1 teaspoon salt. Cook, stirring constantly, until the onions are soft, 5 to 7 minutes. Place the stock in a separate saucepan and bring to a simmer. Add the rice to the saucepan with the butter-onion mixture and stir to coat. Add 1 cup of the stock, increase the heat and cook, stirring, until all the liquid is absorbed. Repeat, adding the remaining stock one cup at a time, and cook until the rice is tender but not soft, about 15 to 18 minutes. Spoon into a large bowl and set aside to cool for about 30 minutes. Step 2 Heat the oven to 350 degrees. Use 1 tablespoon butter to grease a 9-inch springform pan. Sprinkle with 2 tablespoons of the panko, turning the pan to coat the bottom and sides with the crumbs, shaking off the excess. Step 3Make the bechamel sauce: Melt 2 tablespoons butter in a small saucepan over medium heat. Whisk in the flour and cook, stirring, until the mixture is smooth and thickened, about 2 minutes. Add the milk and cook, stirring, until thickened, 3 to 5 minutes. Season with the nutmeg and cayenne and salt to taste. Remove from the heat and stir in 1 cup pecorino Romano cheese. Stir in the peas and the prosciutto; set aside. Step 4Add the eggs and the remaining cheese to the rice, mixing very well. Spoon two-thirds of the rice mixture into the prepared pan, pressing it into the bottom and up the sides to the very lip. Spoon the bechamel and pea mixture into the center. Spread the remaining rice over the filling, smoothing the top and sealing the edges to enclose the filling. Sprinkle the remaining panko over the top and dot with the remaining 2 tablespoons butter. Step 5Bake 45 minutes, until firm. Heat the broiler and place the pan under the broiler for 30 to 45 seconds to lightly brown the top if desired. Let the timballo stand 10 minutes. Run a spatula around the inside of the rim before removing the springform. In Recipes-list.com we have selected the most viewed recipes from category - Main courses . Enjoy the best recipes specially selected for you! 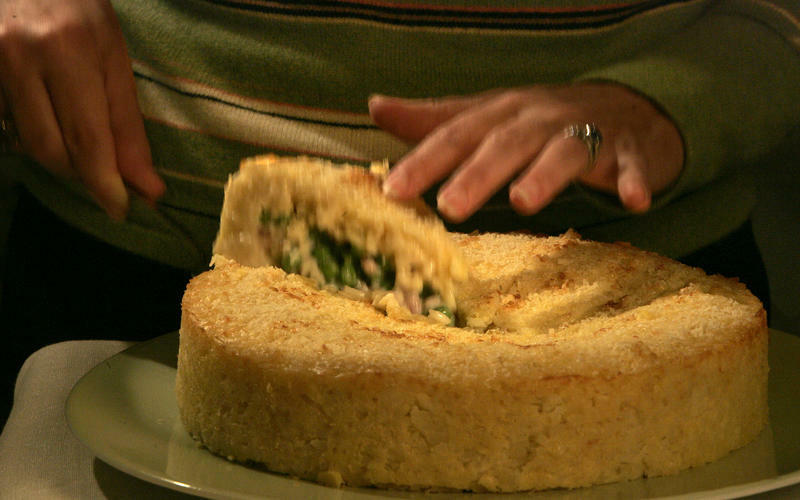 Rice timballo with prosciutto and peas is the right choice that will satisfy all your claims.